...which clearly states on the cover that it is for fans of Downton Abbey. At the time I did not watch Downton, but had heard my friend over at Four Flights talk about it and I knew that it was something I wanted to see. So I felt like I should read this book first. And I am so very glad that I did! 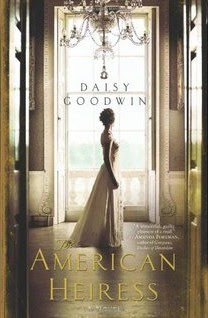 American Heiress tells the tale of a wealthy American girl in the late 1800's sent to Europe in search of the one thing she can't have in America - regardless of how much money she has - a title. 1. This is not a great work of art. It is not a book where I say, What am amazingly flawless work of art. But I loved it anyway. 2. I loved it because I found myself reading slower and slower because I didn't want for it to end. 3. And when it did end, I mourned the characters. I missed them. And then I started watching Downton on netflix and then hulu and I felt so much better equipped as a viewer. I understood the background relationship of the time period of Cora (which also happens to be the name of the heiress in the book - but they are two completely separate characters) and Robert. Fan of Downton? This is one that you can't miss! I've been hearing A LOT about Downton Abbey here recently. A friend of mine in California told me about so I checked at the library, but it is always checked out. We do not have netflix anymore.